A sales gallery summary of the unique art and associated merchandise by Australian pyrographer, Sue Walters. Signed by the artist and produced on a variety of surfaces, each original piece has been meticulously drawn and painted using specialized pyrographic techniques and mixed media. Colour and monochrome work are both available. Commissions are happily accepted and can be discussed and quoted by using the form provided or emailing Sue. Payment methods include credit card, PayPal and money order. Both national and international orders are accepted. Work for sale will be displayed here when it becomes available. I hope you enjoy your visit and feel free to contact me should you have any questions. 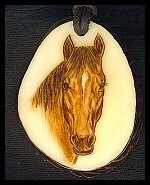 Intricate monochrome and coloured pyrography produced on Tagua. Wildlife, animal and nature themes a speciality. Coloured and monochrome pyrography produced on a variety of timbers, including Australian varieties when available. Pyrography produced on artists rag paper, often incorporating colour. Monochrome pyrography on cow and kangaroo hide. THE PYRO SHOP - RAW MATERIALS TO BURN, BOOKS ON PYROGRAPY, PATTERNS. Click here to go to the PYRO SHOP. GALLERY REPRESENTATION, art sales only.